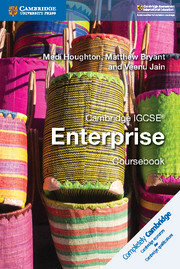 The only endorsed resources for the Cambridge IGCSE® Enterprise (0454) syllabus. Bringing the world of business into the classroom, this coursebook helps students identify, plan, implement and evaluate their enterprise projects. The book has four sections based around the stages of the project with theory integrated throughout. This helps students relate their practical Enterprise project with the academic principles of business. With a foreword from the specialists at Cambridge Judge Business School, this coursebook helps students appreciate Enterprise skills in the world around them and talk to business people in their communities. Suggested answers to the exam-style questions are in the teacher’s resource. The coursebook is structured around the four stages of the coursework, supporting students and teachers with the aspect of the course they are least used to and most worried about. Project Prompts help students with their enterprise projects by linking theory to practice. International case studies, such as a dance academy in India and a charity in Zimbabwe, introduce students to enterprise around the world. Exam-style questions help develop students’ skills and build their confidence with the subject. Graphs and charts give students plenty of practice analysing different forms of information. The free online teacher support is available on our website and helps to reassure teachers when delivering the course.